How Do I Frame a Bay Window? A header extends over the top of a door or a window and adds support. All walls built with studs set at 16-inch intervals or greater require a larger beam to serve as the header. The header rests on two "jack" studs abutted by two "king" studs. Leave the area beneath the header open when framing in a door, or add the "cripple" studs at the bottom of the sill if framing in a window. Add cripple studs above the door or window opening set at the same framing intervals used in the walls. 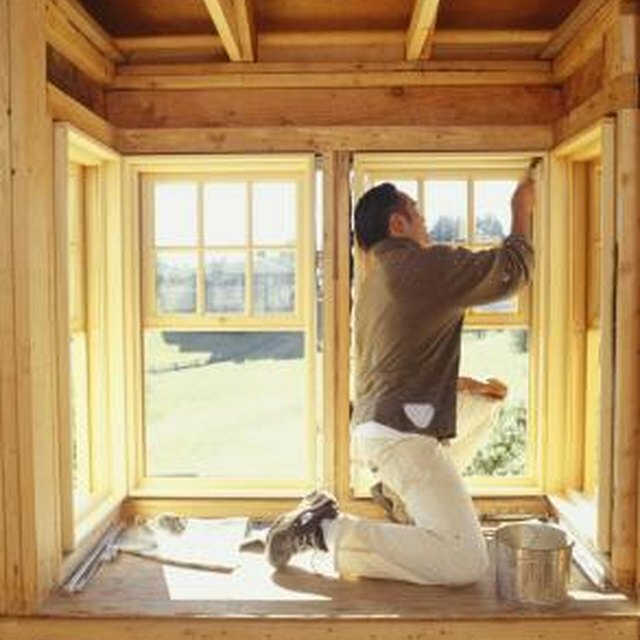 Headers make windows and doors possible in construction framing. Review the plans to ensure the header beam for the window or door opening is the correct size. A house built with standard 2-by-4 framing may call for two 2-by-6 boards joined or two 2-by-10 boards joined and used as the header, depending upon the engineering structure of the wall. Verify with the materials list and engineering specifications for any header call-out details. Measure the starting point of the header in the wall on the bottom plate. At that location, place a jack stud to support the header. The jack-stud height is the same height as the opening. Measure the width of the opening and place another jack stud at that point in the wall. Toenail both jack studs into the bottom plate of the wall frame using two nails approximately 1/2 inch in from the outside edge of the stud. Place a king stud, a standard-sized stud, equal to the other studs in the wall, adjacent to the exterior of each jack stud. Toenail the king into the bottom plate and nail the king stud to the jack stud at regular intervals according to the nailing plan in the engineering specifications. Fit the header between the king studs atop the jack studs. Toenail up underneath the jack stud into the header on both studs. Use 3-inch nails to nail the king stud to the header on either end. Add cripple studs, 16 inches on center above the header. The height of the cripple studs must end at the wall height. Measure the distance from the top of the header up the remainder of the king stud above the header and make the cripple studs the same height. Leave the entire opening empty beneath the header if it is a doorway. If it is a window, add cripple studs and the sill plate to create the bottom dimension of the window. Nail in place. Header dimensions vary depending on the door or window size and the required specifications as set by the blueprint material list or the engineer. Wear a hard hat when working on a construction site. Have a helper assist in installing the header if it is too unwieldy for one person to handle. Use a ladder if necessary.